Curt and Marisa Lewis started with a food truck and opened their barbecue joint at 1104 S. Wilmot Road last year. Holy Smokin’ Butts BBQ is moving to a new location. The local eatery has leased 6,875 square feet at 6940 E. Broadway. Marisa and Curt Lewis, who started their business with a food truck, opened a 2,000-square-foot brick-and-mortar location at 1104 S. Wilmot Road last year. Jeramy Price, of Volk Co., represented the landlord, Broadway Gaslight Center LLC. 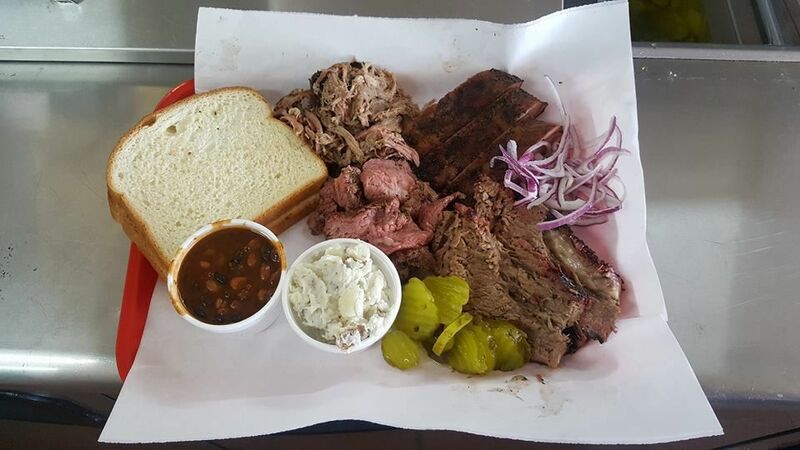 The BBQ shop specializes in smoked meats, from chicken and hot links to pork and brisket, and is expected to open at its new location early next year. HSL Properties bought the Hampton Inn & Suites Tucson East/Williams Center, 251 S. Wilmot Road, for $8.2 million. Renovations are planned for the 101-room hotel, which was built in 2009. Feast Properties LLC bought 28,608 square feet at Houghton Town Center, at Houghton and Old Vail roads, for $575,000 to build a Denny’s Restaurant. Brenna Lacey, of Volk Co., represented the seller, Houghton Developers LLC, and Linton Real Estate represented the buyer. Evolve Physical Therapy leased 8,574 square feet at 3830 W. River Road, in Marana Market Place. This will be the second location for Evolve, which has a location at 1951 N. Wilmot Road. Jeramy Price, of Volk Co., represented the tenant, and Larson Baker represented the landlord. CJR Properties Inc. leased 4,700 square feet at 4275 S. Santa Rita Ave., in the Tucson Business Park. Kevin Volk, of Volk Co., represented the landlord, and the tenants, Carlos and Abagail Callejas, were represented by Chuck Corriere, of Keller Williams Southern Arizona. Banfield Pet Hospital leased 2,426 square feet in Mission Plaza, 4615 E. Speedway. Kevin Volk and Jeramy Price, of Volk Co., represented the landlord, Brazo LLC, and the tenant was represented by Orion Investment Real Estate. Yoshimatsu Japanese Eatery leased 1,200 square feet for a second location, in El Rio Plaza, 1370 N. Silverbell Road. Debbie Heslop and Rick Borane, of Volk Co., represented the tenant. Family owned Crema Coffee leased 1,200 square feet in North Pima Center, 3725 W. Ina Road. Kevin Volk, of Volk Co., represented the tenant. Divine Healing LLC leased 1,166 square feet at 9665 N. Thornydale Road from Fidelity National Title TR 60259. Kevin Volk, of Volk Co., represented the landlord. Rosie’s Barket LLC leased 1,140 square feet in Plaza Escondida, 7960 N. Oracle Road, for a dog boutique. Jeramy Price, of Volk Co., represented the tenant, and CBRE represented the landlord, Roseville Tucson LLC. "I'm very upset over this," owner Ray Flores says.